For all the enthusiasm about the Nigerian technology scene, one thing has not happened – Nigeria is yet to have a unicorn, a private company, largely technology firm, with a valuation of at least a billion U.S. dollars. Sure, the prospect of having a unicorn could be correlated with the size of the economy and the absence of it does not necessarily mean Nigeria is not trying hard enough. It is easier for U.S. to have many unicorns because the “economic forest” is so big to accommodate such special animal breeds. U.S. economy is in excess of $18.4 trillion while Nigeria hovers around $400 billion – a multiple of 46. Nevertheless, in this season of economic diversification pontification, it is important to discuss the state of the entrepreneurial ecosystem and Nigeria’s path to breeding the special animal. With the connectivity and trans-border capabilities that information technology has provided in the world, the creation of innovative companies should not necessarily be discussed within the constructs of geography. As cloud computing redesigns the world of technology, anyone, anywhere, ideally could compete from any location on earth. This means that one does not have to be living in U.S., India, Western Europe, Japan or China to create a unicorn. So, Nigerian entrepreneurs do not have a really valid reason for having not bred the animal in their garages or labs. Good ideas like success have relations while bad ones are orphans. This means any Nigerian entrepreneur with a really transformative idea can see it scale globally and create enormous wealth for its stakeholders. The domicile to generate such ideas is now irrelevant because knowledge is freely shared as Internet has collapsed boundaries and provided means for people to collaborate seamlessly. Also, markets are now more accessible that an entrepreneur can design in one country with its main market in another. Israel with its history of creating innovative technology companies has always seen U.S. as its primary market. Nigerian entrepreneurs can have the same philosophy. The problem though is not the understanding of the markets, rather, on the technical capabilities to engineer products and services with cross-border appeals. An entrepreneur in Niger Republic with its $7.2 billion economy cannot ideally breed a unicorn if it focuses solely on Niger Republic. But when it looks outside for its market, it improves its chances. But entrepreneurs in South Africa and Nigeria have the right markets for them to create unicorns as the economies are relatively larger. The question then is why we are not close? Let us look at Nigeria data. Interswitch, which processes payments for banks and owns a brand of debit cards in Nigeria, is one of the top technology brands in Nigeria. The company was rumored for an IPO in London few years ago. When Helios invested $96 million in 2010 for 52% stake, the company was many multiples away from being a unicorn. 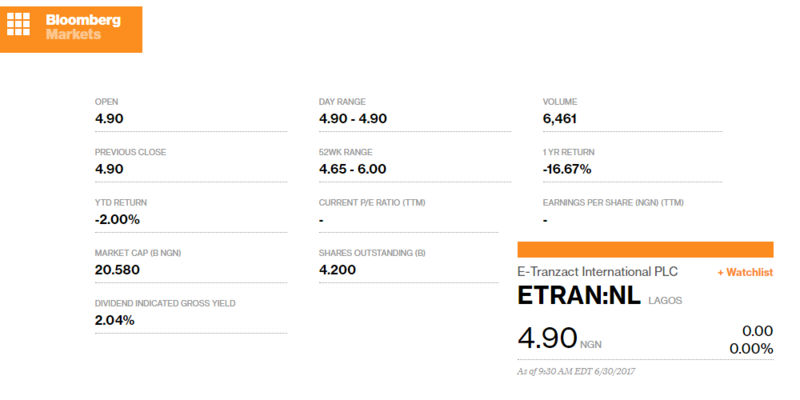 When you consider that E-Transact, a major competitor, has a market capitalization of N20.5 billion (about $68 million) in the Nigerian Stock Exchange, one will expect Interswitch valuation to have been fully priced when Helios invested. The fundamentals in the market have not changed for a revision to hit $1 billion. Besides Interswitch, Konga is another important local technology company. Konga is worth less than $40 million according to public data from its Swedish investors. Jumia (through its then parent, Africa Internet Group) was once heralded as an African company that became a unicorn when it was valued slightly more than $1 billion. But shortly after that, Nigeria went into recession. The fact remains that Jumia is not really an African company. It is an European firm operating in Africa. Today, its valuation is certainly lower. While the company would not provide a full round breakdown, it includes the €75 million ($83 million) AXA Insurance commitmentTechCrunch recently reported. AIG’s best funded ecommerce startup Jumia received over $200 million from 2012-2014 and is valued at $555 billion. The present currency crises, forex scarcity, etc will continue to impact these companies negatively in the Nigerian market which is their largest. For Pagatech, despite the parade of high quality investors, the firm cannot have a market valuation of more than $100 million when public-traded E-Transact is at $68 million, a close competitor. Pagatech has pivoted from its initial mobile money business to all kinds of electronic payment gateways. Though it has seen its business grown, processing more than a $1 billion in transactions, the market has become more competitive with Konga moving into the sector and foreign entrants like Paystack, Remita, Flutterwave, etc all moving into the domain of facilitating and enabling electronic payments in Nigeria. The success of SystemSpecs on Remita which processes payments for federal government and its parastatals in Nigeria indicates that the bulk of the profits are outside the reach of Interswitch, Pagatech and others since the public spending at federal level is a big part of the economy. Losing Nigerian Customs, Securities and Exchange Commission, Corporate Affairs Commission, Industrial Training Fund, etc will mean Pagatech and others will have to focus on the private sector. Incidentally, there is the one technology company in Nigeria the blogosphere does not write a lot, that owner of Remita. That is the SystemSpecs. SystemSpecs is an old company founded by one of the leading technology pioneers in Nigeria. He has more success than anyone in the technology sector in Nigeria at least within the constructs of creating value in the market. John Obaro, the Managing Director, has penetrated every corner of Nigeria’s economy with his products. He is known in governments and he has internal capital to finance PPPs (public private partnerships) which gives his company an advantage over start-ups. That advantage will be strategic as crude oil price continues to fall cushioning governments to seek partners that can fund projects and share revenue. The Remita business model came from that ideology – one that will drive the future in public sector at federal and state levels. How much does SystemSpecs worth? We put it at around $100 million because of the Remita contract with the Nigerian government. Why? Because the public-traded technology integrator, Computer Warehouse Group is valued at $22 million. Though CWG does not compete directly with SystemSpecs, there is an indirect component since CWG specializes in representing foreign companies which offer similar services to what SystemSpecs offers. So, the $100 million we have for SystemSpecs is even generous. We had advocated that both companies “merge”. Together SystemSpecs and CWG can go far. But one is public while the other is private. So largely, only reverse merge can work here. Another is pure acquisition but do not go there. Certainly SystemsSpec is worth more than $22 million the market assigns to CWG Plc, making any talk of acquisition baseless. We also believe that CWG is more than what the market is valuing it, as has noted above. For Omatek, Zinox and similar companies like Task Systems, the individual market valuation is below $50 million despite their obvious local popularities. Public-traded Omatek is valued at $5 million. The Nigerian Stock Exchange (NSE) has a reputation of diminishing the value of technology companies. It is either the analysts do not understand their values or that the companies have not produced results good enough to change that trajectory; both are of course interrelated. Moving to the travel and transportation start-ups, Wakanow and Hotels.ng, the best optimistic valuations for these companies will be maximum of $10 million. Hotels.ng is rumored to have raised its last fund from Omidyar Network and EchoVC at about $4 million valuation. Wakanow, an online travel agent, sees competitions from all angles from Jovago to Trivago. Kuluya, a game company, is valued at $2 million (This company is largely muted now.) Jobberman, the recruitment firm, which was acquired by One Africa Media got out early. Knowing that One Africa Media which owns Jobberman, Cheki, Private Property and other companies has a valuation of $557 million, we deduce the local firms are not even close to being a unicorn. ToLet, Dealdey, NGCareers, Drinks.ng, Oya, and Gloong are promising but none is estimated to be worth up to $10 million yet. Printivo.com, the Nigerian online printing start-up that closed a seed round with EchoVC for the $200 million Nigerian printing sector is estimated to have a valuation of $1.3 million. Possibly, you are waiting for us to get to the big one – iROKO Partners, the big money-raiser from Tiger Global and others until Konga crashed the records with $25 million. We value iROKO Partners for $100 million largely because of its investment holdings in OgaVenue and other firms besides the iROKO brands. And AppZone which is very profitable in which South-Africa’s Business Connexion invested $6 million in 2014 is worth about $25 million. There are other companies like Paystack, Flutterwave (American, technically though), and African Courier Express which Interswitch invested. In these and others we had left, one is close to $20 million in valuation, based on our estimate. In short $20 million is very generous when you recall that Paystack raised $1.3 million seed from many investors. They could not be taking anything less than 10% for that investment. Andela, Wild Fusion and Slot Systems are great companies. Andela which has raised at least $41 million is a top-rate firm. Using peer U.S. firms and discounting its regional operation in Africa (investors do this, unfortunately), we put the valuation at $140 million. Wild Fusion and Slot Systems, individually, will command less than $10 million. Nigeria; now what next? We are on track but still far from seeing a unicorn. We need the entrepreneurial hunters desperately to kill a unicorn because the earlier we can parade one in the Eagle Square Abuja, the easier it will become to have foreign and local investors come to the funding party. Let’s do it! You surely have better perspectives on these numbers. The place below is the square to make your case.